You don’t really know when it was that you slept 8 hours in a row. You don’t even know when was the last time you slept in. You avoid mirrors so not to cross your haggard look, your messy hair, and the engraved rings under your eyes. You get your energy from coffees and your secret stash of sweet treats. And the worst is that even if you work hard, it seems like you’re never finished. Your To-Do List grows day by day, almost to the other side of the world. 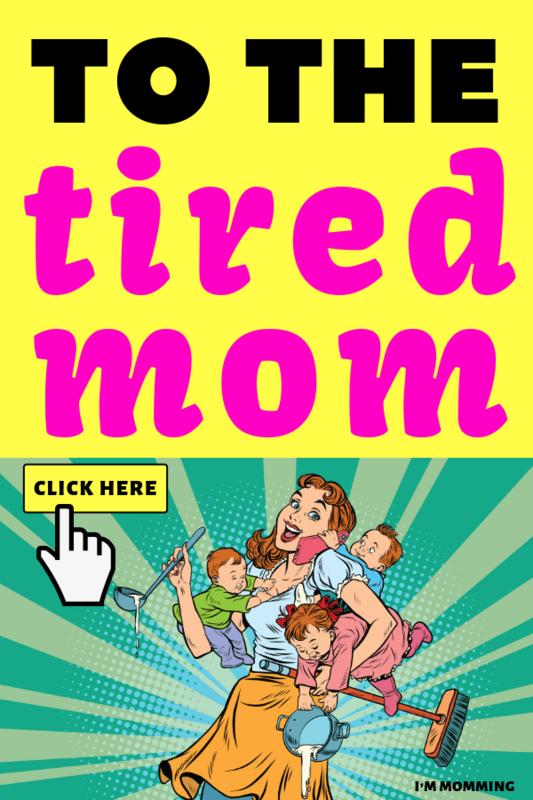 It’s you, the tired mom, or someone you know well. It’s the mom in early pregnancy, green of a morning sickness that never ends. Or the mama of a new baby who fantasizes on the mirage of a full night of sleep. It’s the mom of little ones full of life. The mom with a deployed partner, or a partner working too many hours a week, separated, absent, or not really involved. The mommy who fought many battles and made many sacrifices. Who has the stretch marks, the c-section scar, or her baby’s latest bitemarks to prove it. It’s also the mom on her knees, depressed. You did not see it coming, the heavy tiredness. Even if you had fought it with a frying pan, it almost defeated you in advance because you have too much to do. But we see you, dear. We think that you’re great and beautiful. The difficulties you’ve encountered or overcome have brought out the best version of you. You’re even better now it seems, in the same way that shattered Japanese cups repaired with gold are made wonderful. We see you’re tired, and we’d like to help you. Please try these tips we offer as friends. Give yourself some slack. Your family can eat healthy even if it’s sandwiches or frozen meals. Ask for help, and accept the lifeline. Save yourself before helping everyone. Ask your own parents to babysit your precious a couple of hours a week to have time to breathe, for example. Destroy what you no longer need in your life. Mourn a Spick and Span house and get rid of hundreds of toys while keeping the favorites, to make yourself happy too because you always have to pick up everything. Or mourn your career for a while, to have a more relaxing life. Sleep, beautiful. If necessary take naps, cosleep, and go to bed at the same time that your little one. You’re doing an awesome job. P.S. If you know tired moms, share and brighten their day. Thanks! And get your daily inspiring momming tips here.